The Bair Hugger warming system is used in the majority of hospitals nationwide on patients undergoing surgery. The routinely-used device is stirring up controversy after being linked to a possible increased risk of infections, especially for those undergoing knee and hip replacements. What exactly is the Bair Hugger warming system and how does it increase the risk for infection? Read on to find the answers to those questions and more. What is the Bair Hugger warming system and what is it used for? The Bair Hugger warming system is used to keep patients warm during surgery. The system consists of a warming unit and a blanket. The warming unit uses a motor and heating element to force heated air into the blanket through a hose. The blanket is draped across the patient to keep his or her body temperature from dropping during the surgery. 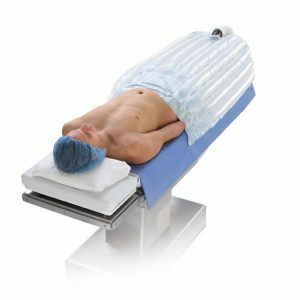 Why do doctors use Bair Hugger warming blankets during surgery? Surgeons use warming blankets like the Bair Hugger to keep patients’ body temperatures from dropping too low during surgery. Hypothermia is a serious complication of surgery. Under anesthesia, patients are unable to regulate their body temperatures, which can drop dangerously low during the surgery. Hypothermia is defined as a core body temperature less than 96.8°F. Research shows that surgical outcomes are better if a patient’s body temperature is kept above the hypothermic threshold. Up to 20 percent of patients experience hypothermia during surgery. These patients are at a three-fold increased risk of complications involving the heart, surgical site infections and surgical blood loss. These patients are also 20 percent more likely to need a blood transfusion than patients who do not experience hypothermia. Surgeons use the Bair Hugger to avoid these complications and improve surgical outcomes. How does the Bair Hugger warming system work? Bair Hugger warming systems use forced air to warm patients during surgery. Forced-air warming utilizes the properties of convection, the transfer of heat from one place to another by the movement of fluids – either liquid or gas. Forced-air warming units transfer heat by blowing warm air across the surface of the patient’s skin. The warming unit draws in air from the operating room, filters it and warms it to the desired temperature set by the surgeon. The warmed air is then pushed through a hose connected to a single-use blanket draped over the patient. The warm air is dispersed across the patient’s skin through tiny holes in the blanket to keep his or her body temperature near normal during surgery. The Bair Hugger’s forced-air technology allows it to transfer more heat at a lower temperature. Who manufactures the Bair Hugger system? Bair Hugger is manufactured and marketed by 3M. The company acquired the system during a 2010 purchase of Arizant Inc., the original manufacturer of the patient warming system. What complications are associated with Bair Hugger? The Bair Hugger system has been linked to two main complications: burns and infections. Burns: There have been dozens of adverse event reports submitted to the FDA over the past decade claiming the Bair Hugger system burned patients during surgery. Many of the reports say the hose connecting the Bair Hugger warming unit with the blanket was not attached correctly, blowing hot air directly onto patients’ skin and causing severe burns. In other reports, patients appeared to be burned by the blankets themselves. One woman reportedly received at least 2nd degree burns on her breasts after undergoing surgery with a Bair Hugger blanket draped across her chest. Infections: The Bair Hugger’s forced-air system has been associated with an increased risk of deep joint infection in patients undergoing knee or hip replacement surgeries. Some studies suggest the forced-air system circulates contaminated particles from operating room floors over the surgical site, increasing the risk for infection. Patients who undergo hip and knee replacements are especially vulnerable to infections, and an infection in the prosthetic device could mean more surgeries are necessary to clear the infection. How does the Bair Hugger system cause infections? After several studies found the Bair Hugger warming system could disrupt the flow of air in operating rooms, the propensity of the device to cause surgical site infections was called into question. In three separate studies, published in The Bone and Joint Journal in November 2011 and February 2012 and Anesthesia & Analgesia in August 2013, researchers concluded that the Bair Hugger warming system disrupted the flow of ventilated air over the surgical site in ultraclean operating rooms. Researchers believe the Bair Hugger’s forced-air system could circulate contaminated particles from the operating room floor over the surgical site, increasing the risk for deep joint infections. This is especially true for patients undergoing hip and knee replacement surgeries. These surgeries are often performed in ultraclean operating rooms, where highly filtered air is circulated through the room to decrease the risk of infections. If the Bair Hugger is indeed stirring up dirt from the floor and circulating it into a patient’s open surgical wound, the risk for infection could be great. Because implants are made of metal or plastic, it is harder for the body’s immune system to attack the bacteria if it attaches to the device. Patients with infected joint replacements may need additional surgery to cure the infection. What are the signs and symptoms of surgical site infections? How often is the Bair Hugger warming system used? 3M estimates the Bair Hugger warming system has been used on over 200 million patients around the world since it came on the market more than 25 years ago. 3M also estimates that number increases by about 50,000 patients each day. The Bair Hugger system is used in more than 80 percent of U.S. hospitals and is currently the number one choice in patient warming systems. Who invented the Bair Hugger system? Anesthesiologist and entrepreneur Dr. Scott Augustine invented the Bair Hugger patient warming system in the 1980s. He founded Augustine Medical Inc. in 1987 through which he marketed the Bair Hugger system after gaining Food and Drug Administration (FDA) approval in 1988. Dr. Augustine served as CEO, chairman and chief technology officer of Augustine Medical until 2002 when he left the company. Augustine Medical subsequently changed its name to Arizant Inc. before it was sold to a venture capital group in 2004. Then, in 2010, Arizant was bought by 3M for more than $800 million. 3M now markets the Bair Hugger warming system. During the course of his career, Dr. Augustine has been awarded approximately 150 U.S. patents for various medical devices, including a competing patient warming system, the Hot Dog. Is there a comparable device on the market? There are several patient warming devices on the market today; some use the same forced-air technology as the Bair Hugger system, while others use a different method of heat transfer called conduction. One competitor of the Bair Hugger warming system is the Hot Dog, invented by the same doctor who invented the Bair Hugger system: Dr. Scott Augustine. Unlike the Bair Hugger, which uses convection to warm patients, the Hot Dog uses conduction to keep patients warm during surgery. It does this by delivering low-voltage electricity to the Hot Dog blanket which warms the patient. According to studies, the HotDog does not pose the same risk for surgical site infections as the Bair Hugger, because it does not disrupt the flow of air in operating rooms. What types of Bair Hugger products are used today? The Bair Hugger system consists of two devices used to warm patients during surgery. Bair Hugger therapy temperature management units – The temperature management unit pulls in air from the operating room, heats it and filters it before pushing it back out through a hose. The units are freestanding or they can be hooked onto an IV pole or bedrail. Bair Hugger intraoperative blankets – Bair Hugger blankets deliver the warm air heated by the temperature unit to the surgical patient. The blanket is connected to the temperature unit by a hose. Tiny holes dot the side of the blanket that is placed on the patient’s skin. As warm air flows from the temperature unit through the hose it fills the blanket and flows out through the holes onto the patient’s skin. Upper body – the upper body blanket covers the upper torso, arms, neck and head and is used during surgeries on the lower half of the body. Lower body – the lower body blanket covers the lower torso, legs and feet and is used during surgeries on the upper half of the body. Torso – the torso blanket covers the upper half of the body beginning at the lower portion of the abdomen up to the head. Bair Paws gown – the Bair Paws gown can be used before and during surgery to warm patients. The gown covers nearly the entire body and has two ports to connect the hose from the temperature unit. The gown includes a temperature gauge which patients can adjust t their desired temperature. Has the Bair Hugger warming system been recalled? The Bair Hugger warming system is still being used in hospitals worldwide. The FDA did issue a recall of some Bair Hugger warming blankets used on pediatric patients in 2005 due to a manufacturing defect. The class II recall was terminated in 2007 and affected about 88,000 blankets in the U.S.
Are there lawsuits against the makers of Bair Hugger? Yes. Hundreds of lawsuits have been filed against 3M and Arizant by patients who suffered infections after using a Bair Hugger warming blanket. The patients allege 3M and Arizant knew there was an increased risk of infection when using their product but failed to warn doctors and patients. Currently, 217 cases have been consolidated into a multidistrict litigation (MDL) in the U.S. District Court for the District of Minnesota. U.S. District Judge Joan N. Ericksen is presiding over the trial. Have there been any settlements in the case against 3M’s Bair Hugger? No. No settlements have been reached in the product liability litigation against 3M and Arizant regarding the Bair Hugger patient warming system. I suffered an infection after undergoing surgery with Bair Hugger. Do I qualify for a claim? If you were harmed after undergoing surgery with a Bair Hugger blanket you may be entitled to compensation. Contact the experienced lawyers and attorneys at Hood National Law Group to see if you qualify for the Bair Hugger lawsuit. Call us today at 1-800-214-1010 for a free case evaluation. You can also use the form on the right-hand side of your screen.